At the Northern summit of the island, under the cliffs is the magnificent Animal flower cave blessed with natural beauty. The sea cave comes with interesting geological and historical investigations. Back in time, the remote sea cave was used as a venue for socializing and dances. 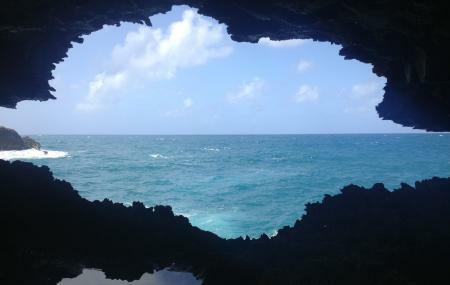 The beautiful cave opens directly into the Atlantic Ocean. You can take a dip in the natural rock pools at the cave as well. Guided tours to the cave are available. Do not miss the cliff-top restaurant above the cave. The cave restaurant serves delicious lunch. If you want to eat in the restaurant, make prior reservations. Carry an extra pair of clothes and a towel. How popular is Animal Flower Cave? People normally club together Harrison's Cave and Bathsheba Beach while planning their visit to Animal Flower Cave. People also prefer to start their day with Animal Flower Cave. Definitely worth the drive! Fantastic views, delicious food, if you are lucky you may even see whales. There is a play area for kids. Our young children had a blast. The owner is truly amazing, and even asked our kids to help him bottle feed his three young lambs. Let’s just say, this was a huge hit. What an amazing experience. We will definitely be back. Thank you for an incredible afternoon. Great view point if you want to see the Atlantic do its thing on the rocks at the northeastern corner of Barbedos. We arrived late so were not able to visit the cave which normally has an entrance fee but it's interesting piece of coastline and well worth a look even if it's just to watch the waves crash into the rocks at the base of the cliffs. The view was absolutely worth it and the restaurant was good but very expressive, probably due to it being a tourist attraction. There is the option to go into the caves which they do charge a bit for as well. Overall I'd still come back to Animal Flower Cave just for the view alone. A must see at the far north of the island. The cave itself is fascinating and the scenery absolutely stunning. In the area are a number of good stalls and the restaurant serves great food. Definitely a place to see when exploring Barbados. Quite the natural phenomenon. A little pricey there, especially if you eat at the restaurant, but you can explore the free walking paths and have your own lunch at the available picnic tables overlooking the beautiful views of the Atlantic Ocean. Should you decide to go down and explore the caves (at a decent price), you won't be disappointed. Our tour guide Shane was fantastic. Kind and informative. He was patient, and let us see it all. My kids had a swim in the natural pool, which was an amazing experience. We were down there for roughly 45 minutes, though we didn't feel timed, or rushed. I would highly recommend Animal Flower Cave, something to see in the northernmost part of the island.